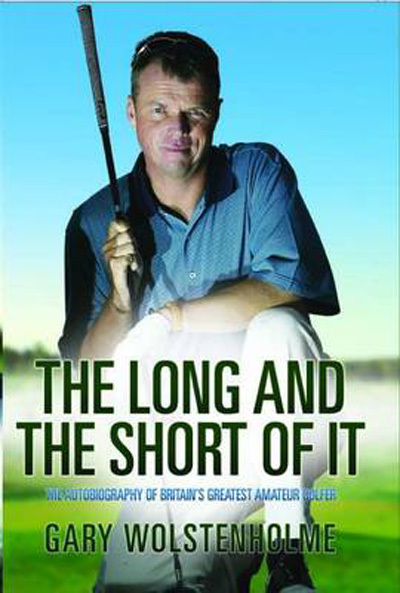 My essential bedtime reading of late has been this fascinating autobiography by Gary Wolstenholme, probably the best amateur golfer these shores have ever produced. But despite his lean, six foot frame and superb short game and putting skills, he was always a figure of some ridicule by many fellow international amateur players because he could rarely hit it within 50 yards of them off the tee. However, what he lacked in prodigious length, he more than made up for in and around the green, despite having to often use a hard compound golf ball to keep up with his colleagues. He was a contemporary of modern-day heroes, Luke Donald, Justin Rose, Ross Fisher and Paul Casey, all of whom admired his skills and the experience he brought to every team at home and abroad. Though only briefly mentioned in an early chapter, I particularly enjoyed reading about his admission of an obsessive-compulsive disorder from which many of us suffer as golfers. "Everything has to be in its place in my life, " he says. " I hate to step on pavement cracks and I get really upset if a caddie puts a club back in the wrong place n my bag. "I don't like mess or things out of kilter and I'm obsessive about arriving on time so I tend to leave ridiculously early to ensure I'm not late," says Gary, admitting that he never uses a No.2 or No.4 ball and uses only matching head covers. "When I travel, my toiletries are always neatly lined up and my coins stacked into tidy piles." revealing that he had other bizarre routines that he avidly stuck to. Mid-way through the 36-hole final of the 2003 Amateur championship, in which he'd beaten Francesco Molinari in the semi-final, he led Swiss Raphael de Souza 2-up and headed for his car to eat a bowl of cereal and listen to the pounding rock music of Queen on his stereo. "I didn't want to wait for someone to serve my food. I like to take control of things myself, " he recalls. "I remembered that Michael Reynard played Gordon Sherry in the final at Royal Liverpool, was kept waiting for his lunch and was penalised a hole for being late on the tee. "It wasn't going to happen to me. Suitably refreshed I birdied the first in the afternoon to go three up and when he made a mess of the second it was all over." I found the book a hugely entertaining read, packed with anecdotes and not at all a catalogue of achievements I'd expected, though they are well documented at the end. Much is self deprecating and funny often at his own expense and compares favourably with 'Unplayable' - the story of Tiger Woods' temporary demise, which I reviewed earlier this year. This book, by the man who beaten him fair and square, comes highly recommended.